The Oswego State men’s basketball team took a 77-56 loss at No. 1-seeded Brockport in the SUNYAC Championship semifinal on Friday night in Vlogianitis Gym. With the loss, No. 4-seeded Oswego finishes the 2013-14 campaign with a 17-10 overall record while Brockport improve to 23-3 on the year. John and I visit Las Vegas frequently because we have family there. There is always something new and different to do – something other than gambling. 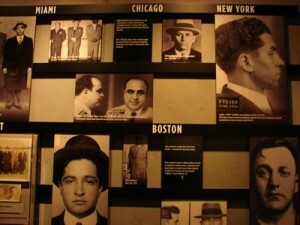 This time we visited the new Mob Museum where the true story of the mob is revealed along with the myths and legends. The Mob Museum opened on Valentine’s Day 2012 in the very building where some of the Kefauver Committee hearings to investigate organized crime were held in the early 1950s. Robyn Yorker’s Blue Team at Oswego County BOCES Stepping Stones Day Program participated in 100 day activities that provided opportunities for the students to practice ELA and math skills. Students in Robert Piascik’s Health Class at Hannibal High School were recently given the opportunity to taste test possible menu items for the 2014-15 school year. New standards for school lunches require that foods be rich in whole grains. At present, at least one-half of the grains offered must be whole grain. Quirk’s Players is the student theatre troupe at G Ray Bodley High School, named in honor of William Quirk. During his tenure in the Fulton Consolidated Schools, Quirk introduced hundreds of students to the wonderful world of theatre and directed numerous school plays and musicals. A free cancer screening health fair will be held from 11 a .m. to 1 p.m. March 11 at Oswego Health’s Central Square Medical Center. Oswego Health and Oswego County Opportunities (OCO) Cancer Services Program have teamed up to offer this event that is open to the public. The event is being held as part of the two health partners activities in March. In an effort to recognize local artistic talent in Central and Northern New York, State Senator Patty Ritchie, along with the North Country Arts Council hosted a celebration of the arts Thursday evening in Watertown. At the event those who have participated in the “Senator Ritchie Celebrates Local Artists” program were recognized. Notable Hannibal High School alumni, staff members and community members will have a chance to shine in the public spotlight as Distinguished Hannibal Warriors during an event in June, and the nomination deadline is quickly approaching. The public has until March 15 to nominate an individual for the inaugural recognition, essentially a Wall of Fame for Hannibal. U.S. Representative Dan Maffei today (Feb. 28) announced he has released a survey to people and businesses across Central New York soliciting their input on the challenges facing local infrastructure and ideas to improve the structural framework that supports our local communities. Maffei will be sending this survey to local municipal leaders and business organizations. Summer is right around the corner and beginning March 1, applications will be accepted for Counselor-in-Training positions at Camp Hollis. Youth aged 15 or 16 years old may apply to be accepted into this training program. Camp Hollis will accept up to four 15-year-old participants and up to four 16-year-old participants.